Peter Mondavi is celebrating 99 years, most of them at Charles Krug Winery. Peter Mondavi Sr. is one year away from a perfect score. As the 99-year-young patriarch of the family approaches the centennial mark, he finds his Charles Krug Winery making its best wines in decades. “Every day I go to the office and see what’s going on, sign some checks and taste the wines to make sure we’re moving in the right direction,” Mondavi recently told Wine Spectator with a smile. His kids call him the Energizer Bunny. “Is he as fast as he was? No,” said son Marc Mondavi. “But he still climbs the stairs to his office every day and goes fly fishing once a year.” Peter’s 99th birthday will be celebrated Nov. 23, as part of the unveiling of the historic redwood cellar and hospitality center at the 150-year-old winery, which has been under renovation for seven years. “We’re bringing ourselves up to date,” said Peter. The new center marks the latest step in the right direction for the family and winery, which has seen its success fluctuate in recent years. Peter and his brother, Robert, grew Charles Krug into one of the biggest and most well-known wineries in Napa Valley during the 1950s and ‘60s, becoming one of Napa’s “Big Four,” along with Beaulieu Vineyards, Inglenook and Louis Martini. For years, collectors rated the Vintage Selection wines as among the best in Napa Valley. Peter made the wines. Robert promoted them. “My brother was a driver,” admitted Peter. “Frankly, I couldn’t keep up with him.” The two often clashed over business matters, which lead to a bitter family feud in the 1960s and a fallout between the two. 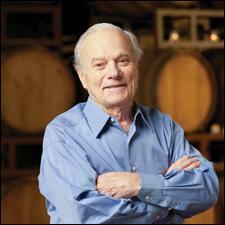 Robert left the family business and founded Robert Mondavi Winery in 1966. The family entered a long legal battle over Robert’s partnership with Charles Krug Winery and, in the end, Peter and his family were able to hang onto Charles Krug, albeit with a heavy debt to pay to Robert. And Robert took Charles Krug’s most precious asset with him—the To Kalon vineyard in Oakville, which was the primary source for the Vintage Selection wines. As time passed, Robert Mondavi Winery moved forward and Charles Krug lost ground. “Robert had a vision. Peter had a vision too, but went at a slower pace; he was more introspective and methodical,” said Tim Mondavi, son of Robert, who made wine at his father’s namesake winery. Charles Krug Winery never achieved the star power of Robert Mondavi Winery. Peter and company plugged along cautiously with moderate success. Without Robert as the driving force behind the business, and without quality fruit, Charles Krug was unable to maintain the consistent level of excellence of their past. The Mondavi story is well-known among wine lovers. Italian immigrants Cesare and Rosa settled in Minnesota, where Peter was born in 1914, a year after Robert. The family moved to Lodi, Calif., in 1922 so Cesare could start a wine grape-shipping business, sending fruit to home winemakers back in Minnesota during Prohibition. Peter’s first job was to assemble and pack 30-pound boxes of grapes for shipping. In 1946, after serving in the army during World War II, Peter returned home to work in the family business. When Cesare died in 1959, Rosa was named president. Robert oversaw the business and Peter made the wines. Robert’s departure proved a tipping point for both Charles Krug Winery as well as Napa Valley. “Every entity has its life cycle,” said Tim. “When things are new, people like the new. Unless you keep them new, they become old.” Robert’s drive never faltered, and he eventually became an American icon and ambassador for Napa Valley. Robert added Opus One and Ornellaia to his portfolio, as well as launching an inexpensive line of table wines from the Central Valley. The world embraced Robert, and Peter embraced Charles Krug. Robert’s ambitions lead to the financial strain of juggling so many ventures and he ended up selling his winery to Constellation. It was more than just adjusting to the rapidly growing region; Charles Krug’s team was adapting to the acceleration in the quality of Napa wines. Its more affordable and widely distributed million-case brand, CK Mondavi Wines, was reaching the masses, but the 70,000-case Charles Krug brand was falling behind competitors’ quality. Peter believes that wines should remain under 14 percent alcohol. Both Peter Sr. and his son Peter Jr., who works with brother Marc, remember the 1970s and ‘80s, when many of the valley’s vines were infected with viruses and it was nearly impossible to generate the sugar levels capable of producing a riper wine. The father is skeptical that the trend of higher alcohol wines will persist, but has allowed his sons to give the wines a slight bump. “We haven’t made the full shift to big, opulent wines; we still have a foot in the old world style,” said Peter Jr. “We’re still trying to produce a wine representative of the variety and where it’s grown,” noting that alcohol levels are now around 14.5 percent, when they were previously around 13.5 percent when his father was making the wines. The results have been positive; Charles Krug’s 2010 Cabernet Sauvignon Generations Family Reserve (92 points, $50) is a rich and graceful wine that balances both styles. As for the future of Charles Krug Winery, it’s always been a family business. Peter Jr. and Marc have started narrowing the Charles Krug portfolio, eliminating some varietals such as Chenin Blanc and focusing their winemaking efforts on Bordeaux-blend wines. In addition to the cellar renovation, the Mondavis have invested $25.6 million into their vineyards in the past 15 years, replanting roughly 75 percent of their 850 acres, committing to the philosophy that no great wine is made without the footsteps of the winemaker in the vineyards. The biggest challenge the Mondavis have faced is what Peter Jr. refers to as “inertia.” “We fell behind and now we have to demonstrate to the consumer how our wines have advanced.” The family has become more selective with their vineyard locations, clonal selections and winemaking techniques. The Mondavis had made most of their Napa wines from valley floor grapes before recently adding two sites on Howell Mountain, and now make two limited-production Cabernets from those vineyards: Rocky Ridge and Cold Springs Vineyards. A new label, Aloft (the 2008 earned 93 points and sells for $150), has also been added to the Mondavi Family wine lineup. Made by one of Napa Valley’s most sought-after winemakers, Thomas Rivers Brown, Aloft is opulent and plush, with deep, extracted flavors. “The hospitality center is a reflection of the level of the quality we’ve brought the wines to; our goal is to put Charles Krug back on that short list of classic Cabernet producers of Napa Valley,” said Peter, Jr. Architect Howard Backen transformed a cellar filled with 175 redwood tanks into a rustic, contemporary hospitality center. The exterior of the cellar, originally constructed in 1872, was built 11 years after Prussian immigrant Charles Krug founded the winery, making it Napa Valley’s first commercial winery. One 10,000-gallon redwood tank remains in the reserve barrel room, as the showpiece for visitors. The rest of the tanks were stripped apart and repurposed in the interior design. The hospitality center’s ground floor will host guests while the final touches are put on the mezzanine floor, which will give Charles Krug the ability to host several private tastings in multiple areas. A deli is in the works for visitors to purchase food and picnic on site. The estimated cost for the renovation was $6 million, but there is still more to be completed. “How much more do you suppose it’s going to cost? About $10 million?” Peter asked his son, with eyebrows raised. Peter Jr. laughed. “Something like that,” he said, grinning. Aaron: Thanks for the memories !! I fell in love with Napa Valley back in the 60's & 70's. The joys of visiting Chas Krug, Beaulieu, Inglenook, and L. Martini. I long for those days when you could visit the Napa Valley tasting rooms and have your wine poured by the wine-maker and/or the winery owner. Alas, today it's like main-street Disneyland; all shuck and jive. The day of the family winery is gone. Happy Birthday Mr. Mondavi, and many more! What would be Napa wine industry today without the Italian heritage...? Enjoyed reading the article and always like to read articles about Napa Valley history. Look forward to seeing the new visitor center as it will have more meaning now and I will see the history "in the walls". Happy Birthday and hope to share a glass of wine with Mr. Mondavi on his 100th birthday! I share David Peters experience and opinion . I remember the old Krug Reserve(?) bottlings emblazoned with their trademark red sash. Wonderful wines, wonderful times! It would be great to see Charles Krug come back to the high level of quality that was produced in the 50s and 60's when Robert Mondavi himself was always responsible for high quality wines with depth and character. The red stripe reserve Cabernets were outstanding and most had long lives to them as does the 74 tasted in the video.